Mauro Giuliani | The six Rossiniane complete, opp. 119-124. 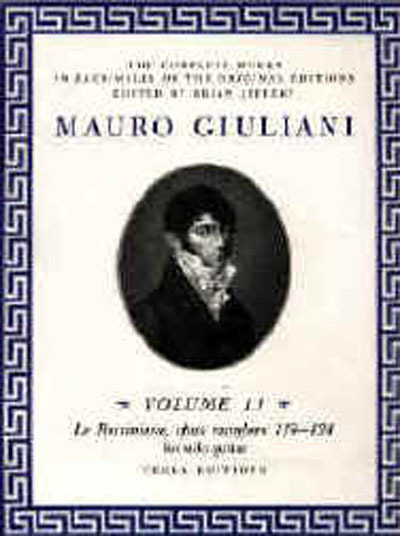 Giuliani's six famous works based on airs from Rossini's operas, complete in one volume. First published in Vienna and Milan approximately 1822-1828, includes bibliographical and historical notes. These six works are fantasias or pot-pourris on themes from Rossini, combining Rossini's melodic gift with Giuliani's instrumental virtuosity. Tecla facsimile edition based on the earliest known editions. Referenced in our 2017 Anniversaries article by Irene Gomez. Le Rossiniane, part 2 op.120. Le Rossiniane, part 3 op.121. Le Rossiniane (Premiere Fantaisie), part 4 op.122. Le Rossiniane (Seconde Fantaisie), part 5 op.123. We also carry the 3CD set of Le Rossiniana.